The Berlin Museum of Civilizations originated from the museum of folkart in Berlin and the European department of the Ethnological Museum also in Berlin. Today the collection comprises altogether about 35'000 textiles and among them are around 1000 samplers. 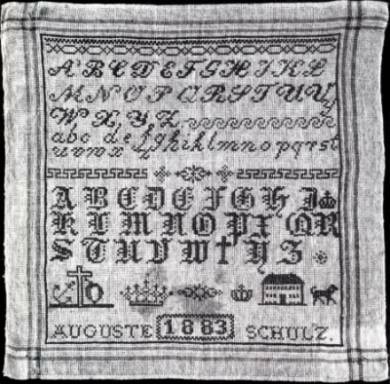 Before world war two there existed a sampler collection of about 3000 pieces. 2850 of them had been carried together by the collector Friedrich Grossmann, but when he died in 1939 about 80 % of them were distroyed. Only around 400 from the original collection survived. The article deals with the alterations of samplers in the second half of 19th c. and their siginificance until the first dedcades of 20th c. At this time it was most important to educate young girls to nobel women and to virtues like order, cleanness, economy, decency. It was also most significant to accustom the girls to discipline and to their future role in the family, church and state. 1 - simplifications of the ornaments. More letters and numbers were embroidered than pictures. 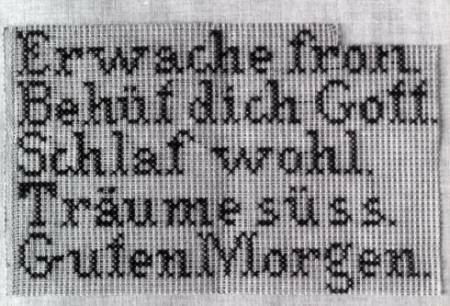 Mostly cross stitch was used and the ground material was not longer silk and linen, but cotton. 3 - Needlework reflects the printed patterns which were produced abundantly and in big editions.